The College offers only B.Ed. course. The duration of the course will be of one year. B.Ed. 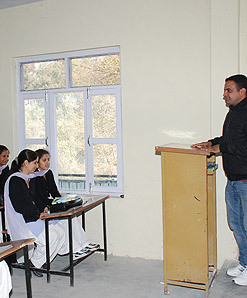 Degree shall be provided after clearance of annual Exams and then a practical exam conducted by Himachal Pradesh University Shimla, usually at the end of academic session, on the date notified by H.P. University Shimla. The college is permitted for intake of 100 B.Ed. students as Co-educational institution. Subject with details of seats is as below. The distribution of seats is subject to change by H.P. University. The reservation for all four streams will be available as per rules of HPU Shimla. The course of study shall be as prescribed by the H.P. University from time to time. The outline of the present course is as under.